Here is a great worksheet to help with persuasive writing, doesn't it all start with an opinion? Helping students with persuasive skills actually gives them a life long skill. Think about it - you want to go on a trip and your significant other doesn't, you need persuasive skills. You want a different car than your partner/parents want, you need persuasive skills. Hence, help our students to understand what is involved to persuade somebody to change their opinion in a productive manner. 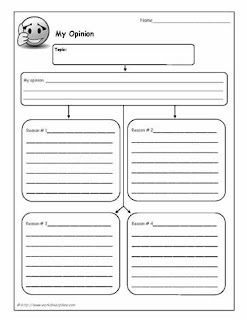 There are a wealth of worksheets/teaching ideas here to get started. Once again, if you have any suggestions, tips or ideas for back to school, feel free to comment back. I luv hearing from you. don't give up and also keep writing seeing that it just truly worth to follow it.